2. Jamie Dixon, coach of the Pitt men’s basketball team, made almost $1.7 million last fiscal year, up over $300,000 from the previous year. I’m sure there are good reasons that a good basketball coach is imperative to the health of a school’s athletic program and that somehow that athletic program turns into a lure for students or something something something. But right now my brain is rejecting all of that on account of ONE POINT SEVEN MILLION DOLLARS. BLLLLLLLLL. It should be noted that he made a million bucks more than Chancellor Nordenberg. 3. PNC Bank is apparently the mystery buyer of almost a complete block of real estate along Wood Street/Fifth/Forbes corridor, likely planning a new skyscraper for that plot, rumored to become their new headquarters. And here I was betting it was Point Park University buying up the plots. Bob O’Connor’s son Corey, he of the desperate need of a spot of Dippity-Do, is likely to take over his father’s old council seat in November after his primary win yesterday. I’m dying to see what his relationship with Lukey will be like. As for Corey’s big issues: “He said his first priority … will be ensuring the delivery of basic services to residents of the district. Asked to elaborate on where services need to be improved, he replied: ‘Obviously, potholes. Everyone complains about potholes. '” Ah, the War on Potholes. I thought we surrendered on the battlefield and gave our cars up to sinkhole graves. Everyone is welcome at this outdoor session, where we’ll be visiting the location of the treehouse and asking everyone for their ideas. Following this activity, the project team will begin to develop design concepts. This will lead up to a June 28 meeting when the preliminary design will be unveiled for input. All this working towards a final goal of allowing Amy to memorialize her children, something she has known she wanted to do since they died two Aprils ago. 6. Another memorial event will be taking place this summer, as mentioned before on this site, the Lisa Clay Styles Memorial Race taking place June 25. On the site, her husband calls her, “The best damn woman I’ve ever seen.” I love that. So raw. Lisa is the young mother who was killed by an under-the-influence driver while running with her child in a stroller in Mt. Lebanon. The race is looking for support in the form of sponsors and volunteers. Go help them! 7. 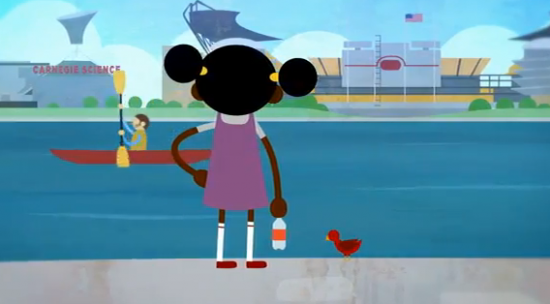 The latest video in RiverLife’s “Living in a River City” animated video series is just adorable, this one a young girl named Louise’s story. 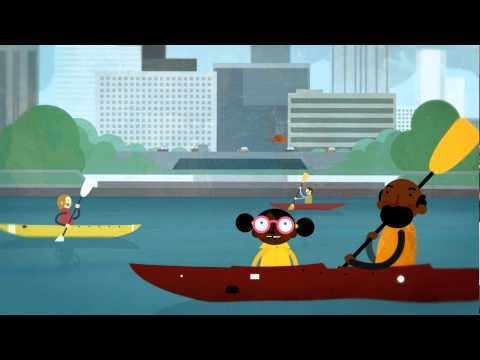 The animated flotilla is awesomesauce. 8. This damn rain is making me use words like awesomesauce. If I say bombdiggity, someone just bitchslap it out of me. If I had known about this school before my kids were too old for it, it wouldn’t have taken my son until he was eight to learn how to roll his Rs. 10. Sidney Crosby and Jordan Staal are living the high-life in Cannes, France for the film festival, taking in screenings and enjoying after-parties on yachts. I’d like to live the high-life one day, but knowing what a giant dork I am, I’d probably just fall off and belly-flop so hard my nose and ears would bleed. I’m the bombdiggity like that. The Pete holds 12506. Avg ticket price of $25. Gate take per game: over $310,000. So Jamie’s salary is covered after 6 home games (or 1/3 of the average home season). And that is without considering concessions, parking, TV money, donations, etc. A good deal at twice the price IMHO. Who cares if his salary is covered after “X” number of games, does a coach who hasn’t made the Final Four deserve $1.7 million? Oh, I forgot, the Big East is just sooo good that winning against those teams in conference is like winning the NCAA Championship. Except wait, Pitt didn’t manage to win the Big East tournament with a double-bye. What has two thumbs and picked Butler over Pitt in the tournament? This girl, right here. Jamie Dixon makes the school money. Jamie Dixon makes less money that he would if he left Pitt for the other jobs he’s been offered. The Athletic Department is seperate from the Academics of Pitt. The Basketball team supports other losing athletics like swimming and track. In the economics of sports, Dixon deserves the money. Basketball and football are the big money makers for the universities, and not only do they cover their own expenses, they also pick up the tab for the rest of the sports (as Oakland Zoo mentioned about). The problem I have is with the economics of sports. How we have gotten so far out of whack as to think a sports coach ‘deserves’ millions, while our teachers and cops and other public workers should be just be thrilled to have a job at all? I am a teacher and would love to be paid like an athlete, even a third stringer. And speaking of fine human beings, just check out those hockey boys! Mmmmmmmmm hmmmmmmmm. Jordan Staal is way lucky that I’m not 30 years younger or I’d have to be stalking him. @LisaB.. What? There’s hockey players in the photo? That’s not what I see! Ooolala.. devil with the red dress on! At major universities, the basketball and football programs are the driving force behind huge sums of booster money for the school. I’m talking tens if not hundreds of millions of dollars, depending on the school. At my alma mater, Michigan State, our basketball coach Tom Izzo makes over $4m a year and is worth every penny. So is Dixon. Loooking at other college basketball coaches salaries ( http://www.usatoday.com/sports/college/mensbasketball/2011-coaches-salary-database.htm ) he is still way underpaid for the success he has had. Guys like Sean Miller (a great Pittsburgher, no insult to him) have no where near the qualifications as Dixon has yet and is making over half a million more than him. Thanks Coach Dixon for staying in Pittsburgh even when being enticed with greater money elsewhere. Anyone else wondering if the “devil with the red dress on” @KGC can maybe, possibly, rewire Sid’s head so he’ll be all better? Might take multiple sessions, but it would be worth a try. And don’t think Sid’s stumbling around Cannes with a phrasebook in hand. He taught himself French, remember, so he could deal with both sets of Canadian media. Heh, good catch, Wingnit. I hadn’t noticed that. This is a good example of how screwed up we are when coaching kids who throw footballs or basketballs are considered more valuable than actual teachers. The amount of money wasted on the sports mega-business is depressing. $1.7M really isn’t that much for a college basketball coach. As others have mentioned, the sports programs really help the school. A national championship in basketball made my degree worth a lot more than it would have been before that national championship. 2. Dont care what Jamie Dixon makes…I bet every year they dont get past the sweet 16…I usually make out pretty well. I don’t know how it works at Pitt, but at WVU the athletic department is self-contained and has its own budget not tied to the university’s. They’re not stealing money from the chemistry department to pay Bob Huggins. BTW, WVU’s athletic department says it made a modest profit last year too (about $4 mil, IIRC), one of about a dozen Division I schools that could say that. IOW, if coaches get a raise, or if they want to have two head football coaches at the same time, the people who pay for that are the donors and the fans and Big East revenue, which is as it should be. If they see Lars Von Trier over there, can they hip check him into a wall for me? I saw Corey O’Connor on the corner of Pocusset and Murray yesterday morning, holding a big “thank you” sign (like his dad did after he won). He was surrounded by older men, and he looked like a confused little kid. Ugh. I don’t know much about him personally, but I’m getting a Luke Russert vibe from him. @ defensemen need love too . . . Paul Martin cleans up nicely. Meow! Not as hot as Sid or Staal, but I wouldn’t kick him out of my bed! I don’t know about you but if I was out on “disability” from my job with a concussion and then photographed partying in Cannes, someone might have a problem with that. Can I get a “just sayin”? Hee!